When you were young, did you live in an urban or rural area? My father was the secretary of a county council and we lived in a small, rural town, but when I was around ten, we moved to the big city. So I started life as a child of the village and then moved to the city. I think that this has influenced my life and my writing because I am conversant with both rural and city life. As a child, were you a keen reader? Yes, my father was well educated by the standards of the day and he was able to introduce us to reading. I went to a secondary school run by British missionary teachers, who also taught us to read – so I started quite early. What sort of books did you enjoy as a child? I read almost all the fairy tales – the Brothers Grimm and Hans Christian Andersen – because they were accessible. We didn’t have Nigerian books because most of the teachers were white missionaries who favoured British books. So we read abridged versions of Dickens, Jane Austen and so on, but the fairy tales made the strongest impression on me. Did you have a favourite story? I really liked Cinderella because she was a poor girl who was liberated through meeting the prince. I also read Snow White and Beauty and the Beast. I really enjoyed all of them. Fairy tales often contain frightening images and storylines. What did you make of these elements? Sometimes as a child I couldn’t sleep alone in a room because the stories, such as Bluebeard, haunted me. I found them terrifying, but they fired my imagination. I started my writing career by producing stories for children, revising some of these fairy tale motifs and situating them in Nigerian culture. I sometimes subverted the format so that women became agents rather than just objects – the girl could save the prince. Was that regarded as controversial? Not really, because they were children’s books. I discovered that most of the books written for children by Nigerians had little boy heroes; there were hardly any active female characters. Three-quarters of the children’s writers in Nigeria are women, but most of them used male protagonists. I’ve written fifteen or so children’s books and three-quarters of them have female protagonists. I thought we needed to empower the girls. When did you begin to think that you might become a writer? When I was at primary school I started drawing little cartoons, putting words into the characters’ mouths and creating imaginary stories. I would read them to other children or to my younger siblings. When I was at high school, I was the president of the drama society and editor of the school magazine. These positions gave me the opportunity to write. When was your first story or book published? About fifteen years ago Heinemann were looking for manuscripts for their Junior African Writer Series (JAWS). I was in the UK at the time, and submitted a storyline, which they liked and paid me to develop. The Buried Treasure was based on the Nigerian Civil War. It was successful, perhaps, because in Africa there are so many wars. Are there many women writers in Nigeria? Yes, we have an association called WRITA. I was the founding vice-president from 1995 to about 1999 and now act as financial secretary. Some have been winning prizes, both locally and internationally. Of course, there are still more men writing but in the past decade the Nigerian government has promoted women’s education, so more and more women are being educated, gaining university degrees and beginning to write. Last year we produced our second anthology of short stories and poetry called Wings of Dawn, sponsored by the British Council. The first anthology was sponsored by the Heinrich Böll Foundation. We have also had support from within Nigeria and we try to raise funds through marketing our books and encouraging members to seek publication. We meet once a month, bringing work to read, and offering constructive criticism and encouragement. How do your social and academic interests feed into your writing? I teach literary criticism and theory, and I find that ideas generated in one sphere feed into and influence the other, although my academic commitments leave me very little time to write. Tell me about the books that you’ve been writing while you’ve been here in Britain. One is about the Nigerian civil war, which I started writing back home and was able to finish here. Another is about trafficked women, and I also wrote some plays and poems for children. I wanted to start writing fiction when I first arrived, but I had writer’s block, so I started to write poetry. I wrote a trilogy about three generations of women. Each play is about women’s experiences in Nigerian society, which is very patriarchal and offers women very limited opportunities. Some manage to survive their problems and predicaments and make a way for themselves, others are destroyed. Today, are there still some women who can’t get an education, even if they want it? If a man has a male and a female child and can only afford to educate one, the opportunity will go to the male. When I was growing up you were lucky as a girl if you went to high school – you really had to come from an educated family to have that kind of opportunity. Most girls married at an early age, or went into nursing. My father and mother understood the importance of a university education for women and I was very fortunate to have parents like that at that time. Today, more and more parents are willing to bend over backwards to educate their daughters. Things are changing. Bibliography and biographical information from the www.ukzn.ac.za page on African writers. 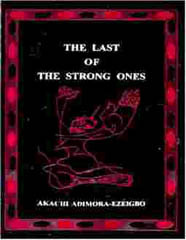 The Last of the Strong Ones (novel), Lagos: Vista Books, 1996. Rituals & Departures (short stories), London: Karnak House, 1996. Hazina Iliyojikwa – Swahili translation of The Buried Treasure – (Junior African Writers Series), Oxford: Heinemann, 1996. Echoes in the Mind (short stories), Foundation Publishers, 1994/ Vista Books, 1996. The Prize (Junior African Writers Series), Oxford: Heinemann, 1994. Rhythms of Life (short stories), London: Karnak House, 1992. The Buried Treasure (Junior African Writers Series), Oxford: Heinemann, 1992. A Companion to the Novel, Lagos: Vista Books, 1998. Gender Issues in Nigeria – A Feminine Perspective, Lagos: Vista Books, 1996. Fact & Fiction in the Literature of the Nigerian Civil War, Lagos: Unity Publishing & Research Company, 1992. Akachi Adimora-Ezeigbo, university lecturer, writer, novelist, critic, essayist and journalist, was appointed a professor of English at the University of Lagos in 1999, where she has taught since 1981. Before becoming a university lecturer she taught in secondary schools and a Teachers College. She was a member of the Editorial Board of two newspapers in Lagos where she wrote editorials, feature articles and maintained regular columns. 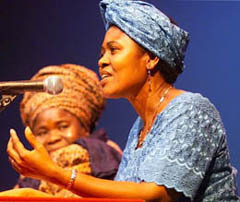 Adimora was National Treasure of the Association of Nigerian Authors (ANA) from 1995-97, and Vice President of WRITA (Women Writers of Nigeria) from 1998-2000. Apart from publishing over thirty academic papers and having her short stories appear in five Anthologies, she has published twelve books. 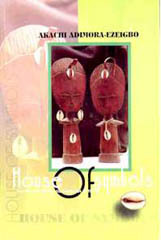 In 2001 Akachi Adimora-Ezeigbo was awarded the highly sought after ANA/Spectrum Prize for her book, House of Symbols, and the Zulu Sofala Prize for Women Writers for the same book, which the literary magazine, Lumina, described as ‘a profound work of immense significance which fills an aching vacuum in African literature’. Reuben Abati, frontline journalist and critic, speaking as the representative of the panel of judges at the Annual Literary Awards Night of ANA and WRITA, said of Ezeigbo’s prize winning work, ‘Ezeigbo’s characterisation of women is instructive; her women are properly adjusted members of the community with a parallel line of authority in traditional governance, they assert themselves and are respected in their own domain’. Akachi was a visiting Common-Wealth Fellow at the School of Oriental and African Studies, University of London, and a Research Fellow at the University of Natal, Pietermaritzburg. In 1994 she also won First Prize in the WORDOC Short Stories competition. One Comment on "Rescuing the Prince"
House of symbols is a novel with gender complimentarity.